This healthy and power house breakfast, was made the early night and refrigerated overnight. Handful of fresh fruits can be topped to make it a complete breakfast! There are n number of benefits turmeric has in store, all that is needed is to source good quality turmeric. January is the season of fresh turmeric hence i made use of it. 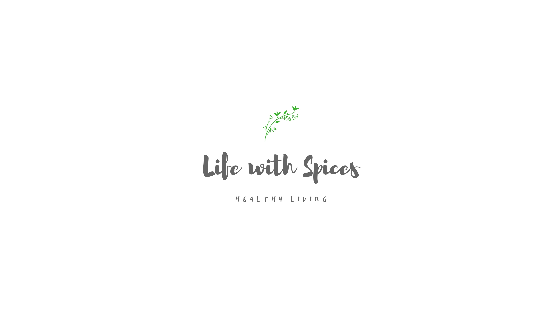 I use them in my smoothies, instant pickles, salads, raita, chutney and what not. In a blender add in milk, turmeric powder, grated turmeric, sweetener if using and blend until smooth. Add in chia seeds, nuts, dry fruits, coconut flakes or chips, mix well and transfer to the serving containers and refrigerate overnight. Top with fruits and serve it for morning breakfast. 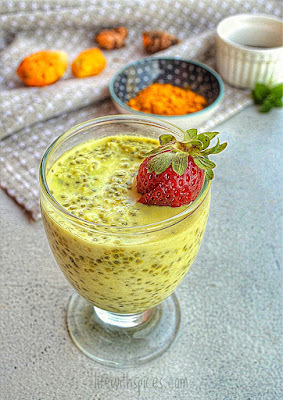 Never used raw turmeric though I do find it in the supermarkets here.. a turmeric milk chia pudding sounds really delicious! Looks appealing! I looked up the Tamil name for chia seeds and find it is ஆளி விதை. I have never seen being used. Is it by any chance கொள்ளு? You come up with some unique items! I posted a comment but has failed to appear. What is the name of chia seeds in Tamil? Could it be கொள்ளு?Anyway the drink looks tempting like Badam Khएवर! Hello KP, No clue about tamil name. Its some what like our falooda seeds used in icecreams but not them. Chia seeds has numerous health benefits, mostly used in breakfast with oats or smoothies. Aali vidhai is flax seeds, many have updated incorrect informations about chia in tamil. Its like small sesame seeds it bulges up on soaking.